This is nothing but preparing various savouries and mixing them together. Since at least 10 items are mixed, it is also called as dashAvatAram. The following ingredients are prepared separately and mixed together. We will see later how this done after preparing the constituents of mixture. In all the preparations where you use flours, first sieve them to remove impurities or lumps if any. Sometimes there may be small red beetles as such this is necessary. Add bESan, rice flour, asafoetida, salt, and 1 small ladleful of refined oil and mix well in such a way so that the mixture should remain together if pressed and loosen if just tapped. If this does not happen, then add a little more oil and mix well. Now, add a little water and knead to make tight dough. Heat oil in a KaDAi and drop a little piece of dough. If it puffs up immediately then with the help of OmappoDi press (NAzhi), press the OmappoDi directly onto the oil surface. At a time, you have to press only one ring to fry. Remove it immediately when it is golden yellow in colour because it will turn dark brown faster. Omam means Bishop’s weeds (ajwain) as such we may use if you want. But if you use the seeds directly, then the holes of the press will be clogged by these and you cannot press. Instead, grind 1 tsp weeds with a little water, strain and mix the extract with the flour. 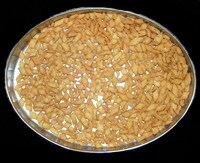 Remember to clean and wash the seeds for impurities, if any. However, I do not use Omam. After sieving, mix BESan, rice flour and salt well. Then add water and make it into a batter of semi solid consistency as explained for BUndi lADu. 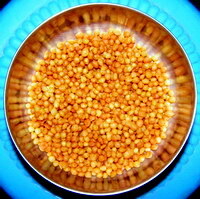 Heat oil in a KaDAi and test whether the droplet of the batter puffs up immediately. Keep the bUndi ladle just above the oil and pour the batter in the ladle so that bUndis fall onto the oil surface. Gently tap the ladle if the bUndis do not fall immediately if the consistency of the batter is thick. If needed, you can dilute the batter a little to facilitate this. As in the case of bUndi lADus, here also you need to prepare bUndis in separate lots. When bUndis become golden yellow, remove from oil. Ensure that the bUndi cracks when you press unlike the bUndi of LADu. This is nothing but thick OmappoDi with pepper instead of Omam. After sieving the flours, mix all the Ingredients and a small ladleful of oil. Before adding water, test for togetherness of the flour with oil as done in the case of OmappoDi dough. Then add a little water and knead to make stiff dough. Heat oil in a kaDAi, test for puffing up and press the kArA SEv with the help of tEnkuzhal press (NAzhi) directly onto the oil surface. Do not use the OmappoDi press as it has small holes. 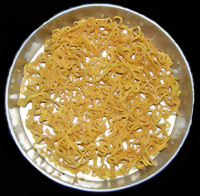 When the SEv turns to golden colour, remove from oil. Sieve ½ cup of the flour and mix with salt and 1 tbs of oil. Add a little water and knead into tight dough. Make small balls. Roll each ball like chapAtti and then cut into small diamond pieces. 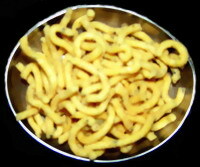 Fry these to golden brown colour in oil. In the same way, mix the remaining ½ cup of flour with sugar and 2 tbs oil well. 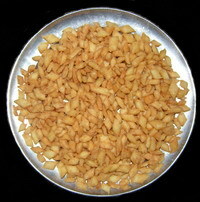 Prepare sweet variety like the salty one described above. Instead of sugar crystals, you can use powdered sugar also. This entry was posted on October 19, 2011 at 10:07 pm and is filed under Thamizh Festivals with tags ajwain, all purpose flour, asafoetida, Bengal gram dal, Bishop’s weeds, black pepper, chana besan, cumin seeds, Dashavataram, Deepavali, diamond biscuits, Dipavali, Diwali, Kara Boondi, Kara Sev, maida, omam, Omappodi, red chilli powder, refined opil, rice flour, salt, Sev, spicy biscuits, sugar, Tamil festivals, Thamizh, yellow kesar powder. You can follow any responses to this entry through the RSS 2.0 feed. Both comments and pings are currently closed.